Ask fellow campers about "Tropic Winds RV Resort (55+ Park)" and nearby attractions. Tropic Winds is a clean quiet park. RV sites are a good distance apart. Park has a good number of activities to appease everyone. Called ahead of time to acquire about a mailing address for some packages expected. We were given instructions on where to go when we arrived on Sunday. Office was closed. We found a spot and set up. On Monday we were told we were in the the wrong area and the instructions we were given were incorrect. We had to move spots. Another couple had the same situation. No apology given. The original spot we had taken was empty the whole two weeks we were there. The mailing address for a UPS package that we were given was also wrong. The package could not be delivered. We had to go to the UPS depot to pick it up. Other than those two issues Tropic Winds is a fine park. Management could use a few lessons in communication and customer service. We camped at Tropic Winds RV Resort (55+ Park) in a Motorhome. 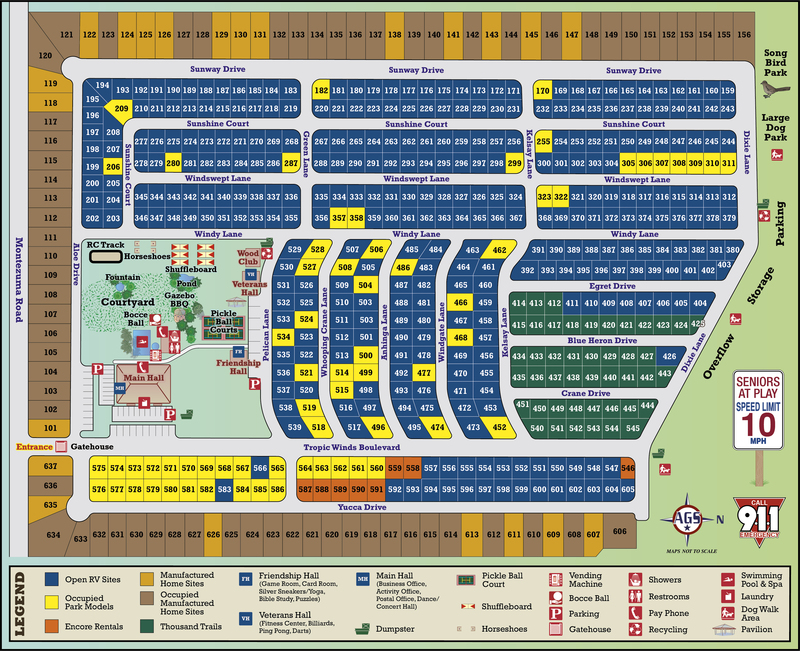 This is a great RV park by the airport, somewhat out in the country - 531 sites. The roads are nice & wide and the spots have some space to them. There are many activities available. You pick & choose which ones suit you. We looked at 2 other Encore places. One where the roads are too narrow for our RV and another which has 1200 sites and where the cost is double. Pick the one that works the best for you. We camped at Tropic Winds RV Resort (55+ Park) in a Motorhome. You are out in the country. 1 Hr from S. Padre and 1 hour from major shopping. You need to decide if you want to live in the hustle and bustle or out aways. There is no such thing as a perfect RV Park/Resort. Just do your homework. They all have their pros and cons. It's just personal preference. The rate is for a three month stay offered to Thousand Trails members and does not include electric. The electric rate was $.12 a KWH. All easy back-in sites that are slanted toward the paved road. We were able to easily level our 40 motorhome while keeping all wheels on the ground. The large concrete slab at every site is for the car/truck parking and the RV is parked on the grass. The streets are wide and paved. Most of the streets are slightly angled so heavy rains drain down the middle to large storm sewer drains. The sites are generous and excellent utilities conveniently located at the rear. Great cable TV is included free of charge. Our Verizon broadband service was 4 bars/4G. Plenty of in-season activities. Have a really nice RC car track, horseshoes, shuffle board, very nice well maintained pool. The park is almost exclusively planted with tall palm trees, so there in minimal shade but good for satellite TV reception. The park maintenance is excellent. The location is rural yet only about 4 miles to downtown Harlingen and a Super-Walmart. The only thing that stops this park from being a 10 is there are not picnic tables and no on-site fishing. We camped at Tropic Winds RV Resort (55+ Park) in a Motorhome. On this trip we stayed for 4 months. We have stayed here twice on extended stays and found the park to be comfortable with friendly staff and residents. Tropic Winds caters to long term renters but does not exclude short term guests. All sites are "back in" and spacious. We have not been disappointed here. In the fall/winter there are organized activities and at the other times activities are guest generated. We camped at Tropic Winds RV Resort (55+ Park) in a Fifth Wheel. Convenient to all of the Rio Grande Valley activities - fishing, walking/hiking, bird watching, butterflies, Mexico, etc. During the season it's a good place to stay with many activities. Odd park in that you have to set up your RV on the grass next to the paved site for your tow car or truck. Flat and ez place to get a satellite signal. Not real close to restaurants and shopping but a short drive. I've used the pool in the past and it's nice. They didn't have anyone around when I arrived and I had to call an 800 national number to get checked in although I had reservations. I will stay here again. We camped at Tropic Winds RV Resort (55+ Park) in a Motorhome. Short drives most everywhere. You're an hour from South Padre Island and about 40 minutes from McAllen and Brownsville. I would not advise going to Mexico these days as there has been a lot of violence in Matamoros and Reynosa. Stayed first 3 nights using Passport America, this rate was $23 i think. Joined Thousand Trails while here and extended 4 more nights. Nice facilities, many activities. Main hall with the admin offices, separate building for cards/games/pool/ping pong/exercising. More of a snow bird park than simply a camping, state park atmosphere. We camped at Tropic Winds RV Resort (55+ Park) in a Fifth Wheel. Great rv park. Many Winter Texans with a lot of activities. We found the RV sites large compared to many others in the valley. Park on grass but has long concert pad. Full hook ups with free cable. Free wi-fi but only at large main hall - has 2 other buildings for activities too. Price reflects 5 month stay. We camped at Tropic Winds RV Resort (55+ Park) in a Travel Trailer. A huge Encore park designed for long term stays with park models and many activities and facilities, e.g. heated pool, shuffleboard, bocce courts, horseshoe pits, and RC car race track. A remodeled laundry room is very nice. It also has cable TV and full hookups with good utilities. However, the office is not open on weekends, which is inconvenient for short time stays, the Wi-Fi is not free except in the main hall, the interior roads are narrow, and RVs are normally parked on unpaved ground, which means if there is, or has been rain, the RV has to be parked on the paved patio area, leaving no patio area for sitting out. Sites are adequate but not roomy. Considering all the parks available in the valley, we will look for another park in the future. We camped at Tropic Winds RV Resort (55+ Park) in a Motorhome. Overall a good park. Office staff is pleasant and helpful. Many activities, although it seems the permanent tenants tend to be cliquish. Good roads, well-placed utilities, reasonably sized sites, but no picnic tables. Only complaint was the man who runs the big riding mower ... he was rude and inconsiderate as he mowed what really didn't need mowed as a wash/wax vendor worked on our rig. He acted quite inconvenienced by the water hoses, buckets and brushes and simply ran his machine within inches of those workers and me. I attempted to get his attention, but he wouldn't even make eye contact. We camped at Tropic Winds RV Resort (55+ Park) in a Motorhome. This is a 55+ resort. It is owned by ELS (Thousand Trails and Encore). It is located in the city of Harlingen, Texas, right in the Rio Grande Valley. Easy drive to S. Padre Island. The park is large, with 535 sites with over 400 being RV sites, and the sites are spacious. Concrete Patios 10X40 feet. 30/50 amp electric. There are quite a few permanent park models, but the majority of the residents are in RVs, quite a change from the usual snow bird parks. There are activities galore (over 450) and super friendly people. A very active community. The park is far enough out of town to feel like it is in the country, but close enough to everything that there is shopping, dining and entertaining only a few miles away. Thousand Trails has about 45 sites here and, depending on your membership you may be able to stay for 2 weeks at $3 a night. Not eligible for Zone members. Thousand Trails members also get a greatly reduced site fee for a seasonal stay. With a cafe called Windy Cafe and street names like Windy Lane, Windswept Lane, and Windgate Lane You can bet that this area is windy, There is also Sunshine Court and Sunway Drive, so expect lots of sunshine as well. I would have given this park 5 stars, except that the bathrooms near the pool are very badly in need of renovating. Everything else is just about perfect. Thanks to the wonderful office, activity and maintenance staff. We camped here in a 39 foot motorhome for 2 1/2 months. Will we come back here? You betcha! We camped at Tropic Winds RV Resort (55+ Park) in a Motorhome. Larger than average sites, especially for a park as big as this. Friendly staff and lots of activities. This is an age restricted park and so is not kid friendly; although, they said they will make exceptions for short stays. The park is well organized with good roads. There are many permanent residents but they were very welcoming, too. We stayed as part of Thousand Trails program but had to pay a reasonable $3 per night resort fee. We enjoyed the stay and would return if we were in the area. We camped at Tropic Winds RV Resort (55+ Park) in a Motorhome. Pretty typical Encore park. Sites are small for a large motorhome. Ours is 45' and our mirrors were in the street. No place to park a towed. No hot water in the showers, lukewarm at best. Jacuzzi is way too small for 535 sites, but it was warm. Pool is heated. Extra charge for 50amp service. Extra charge for internet. Lots of speeding by golf carts, driving side by side, cutting corners etc. Be careful if you have an end unit. Lots of noise from the International airport a mere 2 miles away. With all the camping available in this area, there are many parks that offer more. We wouldn't return. We camped at Tropic Winds RV Resort (55+ Park) in a Motorhome. We have stayed at this park several times in the past 10 years, using our Thousand Trail Membership. Park is primarily used by Winter Texans and permanent residents. Sites are spacious with a mixture of grass and dirt to park on and a concrete patio slab. Interior roads are in good conditions, but I should note that when it rains the parking sites get very muddy. On several occasions when it rained, we noticed that RVs had to be pulled out of the mud. Laundry is super small considering the size of the park. There are lots of organized activities for senior citizens, but please consider this park unfriendly to children for obvious reasons. We have enjoyed all our stays, primarily because of the price and location, but will probably consider another Encore Park in the future. Rate reflects a Thousand Trails discount. We camped at Tropic Winds RV Resort (55+ Park) in a Fifth Wheel. Good place to hang out for a while. Mostly Winter Texans here for several months, but about 40 sites are designated for Thousand Trails members. This was our third time here. Tuesday night's hamburgers are very good! We camped at Tropic Winds RV Resort (55+ Park) in a Motorhome. The rate reflects the monthly rate of $479. Wi-Fi is extra using TengoNet which we didn't subscribe to. The Park is very quiet despite being located close to the Valley International Airport. The sites are wide and there are lots of activities including Pickle Ball which is not mentioned on their website. We found the people to be very friendly. 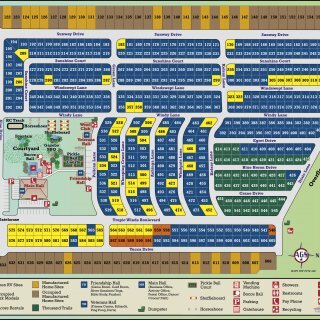 The park is conveniently located to all shopping and many attractions. The washrooms are used by those using the pool as well as the outdoor activities and are in serious need of updating. I used the toilets only while playing pickle ball and the pool and would not want to use them to shower. The Entertainment Director brought in a number of entertainers which were good and one that was very good and all tickets are very reasonably priced. The only negative with staying here is the winds which blow pretty much every day; some days the winds are light but we found them to be quite strong most days. We compared the winds here with Mission TX where we stayed for December and when the winds were really blowing Harlingen was at least 5 mph stronger. 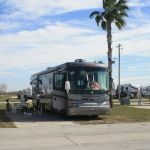 We loved this RV park and would most likely stay here despite the winds! We camped at Tropic Winds RV Resort (55+ Park) in a Motorhome. Are you affiliated with Tropic Winds RV Resort (55+ Park) ?